Vauxhall has announced details of the 2019 Vivaro. The Vivaro, and indeed the Renault Trafic which shared the same body style and underpinnings in the outgoing guise have been a staple of many smaller minibus fleets for use on school, welfare contracts and for coach tour feeder work. In November 2017, Vauxhall was purchased by PSA Groupe, the owners of Peugeot and Citroen. Although Vauxhall has sold over 250,000 second-generation Vivaros, a decision was made to develop the third generation Vivaro on the PSA Groupe’s EMP2 platform. The good news is that the new generation Vivaro will still be built at Vauxhall’s Luton van plant, securing 1,250 jobs and upping production capacity to 100,000 units per year. An all-electric version is also being developed and will be built from early 2021. 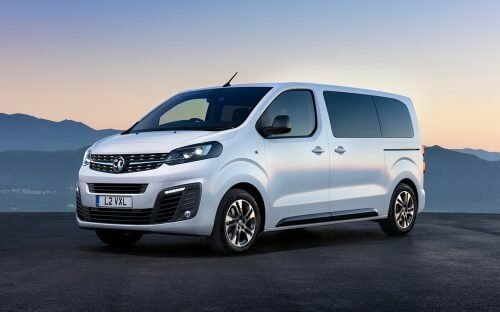 Details of the Vivaro Life model reveal that it will be available in two sizes, but both with have the option of up to nine seats. The longer wheelbase 5.30m is obviously more suitable for minibus sector applications, but a 4.95m version is available for operators who require a shorter wheelbase. The longer wheelbase offers operators a luggage capacity of 4.5 cubic metres. Vehicle height on both models is less than 1.90m to allow the Vivaro access to underground parking garages etc. The new model has options for leather seating, tables in four-seat configuration, two-piece panoramic roof and an opening window in the tailgate. Electric sliding doors which open via foot-movement are an option. Seating capacity options for leather seating are four, seven or eight. Cloth seating options are four, six, eight or nine. The driver has access to a head-up display and a camera/radar-based active cruise control that can detect pedestrians at speeds of up to 18mph and apply emergency braking if a collision is likely. Engine options available are all diesel, a 1.5 litre with 118bhp for city applications and a 2.0 litre which has two ratings, 148hp or 178hp. The four-wheel drive option that was available on the current model has been phased out and replaced with PSA Groupe’s InelliGrip, which is a traction control system that helps on loose or wet road surfaces. The World premiere of the 2019 Vivaro will be held at the Brussels Motor Show this month. Vauxhall will be taking orders from February.